At extreme latitudes, what we would think of as the typical day/night cycle becomes very different. The sun remains continuously visible for one day during the summer solstice at the polar circle, for several weeks only 100 km (62 mi) closer to the pole, and for six months at the pole. At extreme latitudes, the midnight sun is usually referred to as polar day. [I]n practice the midnight sun can be seen as much as 55 miles (90 km) outside the polar circle ... and the exact latitudes of the farthest reaches of midnight sun depend on topography and vary slightly year-to-year. Presumably, native communities in the Arctic felt this was a normal pattern of the seasons. Were they aware that other places had a different day/night cycle? This could perhaps be mentioned in their mythologies or tales of other places. I ask about the Arctic because there were far more people living in the high Arctic than equivalent regions in the south. I'm mostly curious about North American societies, but an answer could discuss European/Siberian people as well. The variation in day length is more extreme as you approach the poles. As soon as the measurement of time is possible in a culture, and individuals of that culture are capable of travelling substantial distances north and south, the second and third facts will be observed. As hunter-gatherer societies such as the Inuit, Aleut and Suomi meet all these criteria, we have no reason to believe that the following deduction was not made. Far enough north (in NH) the sun will not rise and set during the longest days in summer and the shortest days in winter. Far enough south (in NH) the sun will always rise and set, even during the longest days of summer and the shortest days in winter. The Caribou Inuit rely on the Caribou herds of Northern Canada exclusively, and follow them on their migrations across the height of the Canadian Far North. These migrations cross the Arctic Circle, from Hudson's Bay to the far reaches of Ellesmere Island, and occur semi-annually, in spring and fall. Similar caribou migrations occur across the height of Eastern Alaska, and of reindeer herds followed by some of the Suomi people in modern Scandinavia and Siberia. 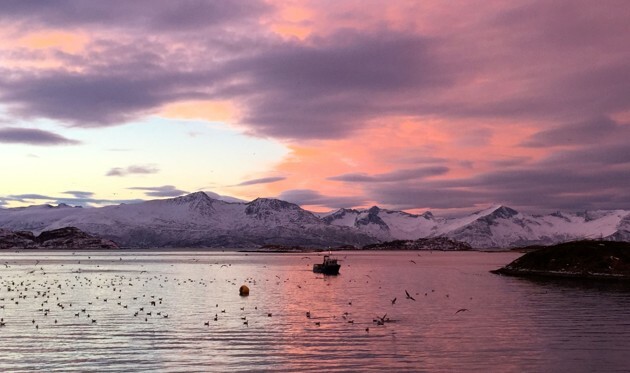 Over the following months I learned firsthand that, far from a period of absolute darkness, the Polar Night in Tromsø is a time of beautiful colors and soft, indirect light. Even during the darkest times, there are still two or three hours of light a day as the sun skirts just below the horizon, never fully rising. During the longer “days” of the Polar Night, in November and January, the skies can be filled with up to six hours of sunrise and sunset-like colors. The detailed pattern of day and night is different above the Arctic Circle, but not in a fundamental way. The 24-hour cycle remains intact, just different in degree thnn what would be experienced a few hundred miles further south. Not the answer you're looking for? Browse other questions tagged social-history native-americans arctic or ask your own question. What Land Runs were there in the U.S., and were the Indians paid for their land? How did ancient Nomadic communities conduct trade?